The True Mirror idea is simple (and old; it was first patented in 1887): place two mirrors at right angles and have a look-see. Its effect, though, elicits the complexities of realization spanning everything from Whoa! to Noooooo! Traditional mirrors reflect images backwards, often giving us a sense of self that isn't really what others see when they gaze upon our beauteous mugs. By adding literal depth to the reflective medium with its seamless integration of a perpendicularly-placed looking glass tag team, the True Mirror is able to award us a more authentic view of ourselves, imparting a figurative depth to our understanding of who we are. Some people are pleased with what they see. To them, the True Mirror connects physical with intellectual and emotional selves. It reflects a person more recognizable, more internally relatable than a flat mirror. Other people don't like it. They don't like it one bit. They freak out and run amok. This is one reason the True Mirror tent is a yearly sensation at Burning Man. True Mirror's primary selling point--why it's better than just buying two cheap pieces of mirrored glass and setting them up at right angles--is its perfect optics. 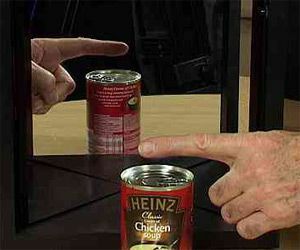 It reflects non-distorted images, as well as renders the distracting seam at the mirrors' connection point undetectable. And while similar "forward" images of ourselves are of course possible with cameras and video, their static and non-eye-to-eye views tend not to carry the same level of profundity as a good ol' session of Who's the fairest of them all?. The True Mirror is a top Dude Novelty Gift pick. Suggested via Dude Product Tips by Manny. Have you tried the True Mirror, Manny?